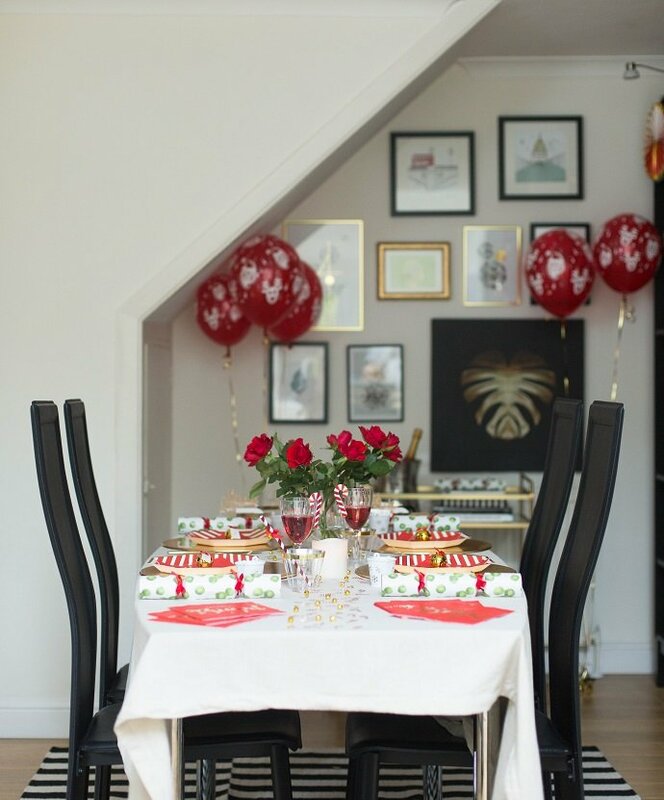 Christmas is the perfect time to inject a bit of colour to your decor. 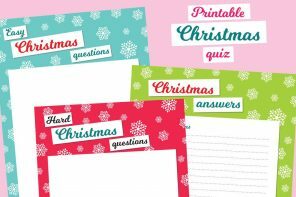 Luckily the Merry & Bright party theme comes complete with napkins, plates and more for a perfectly curated and colourful Christmas. 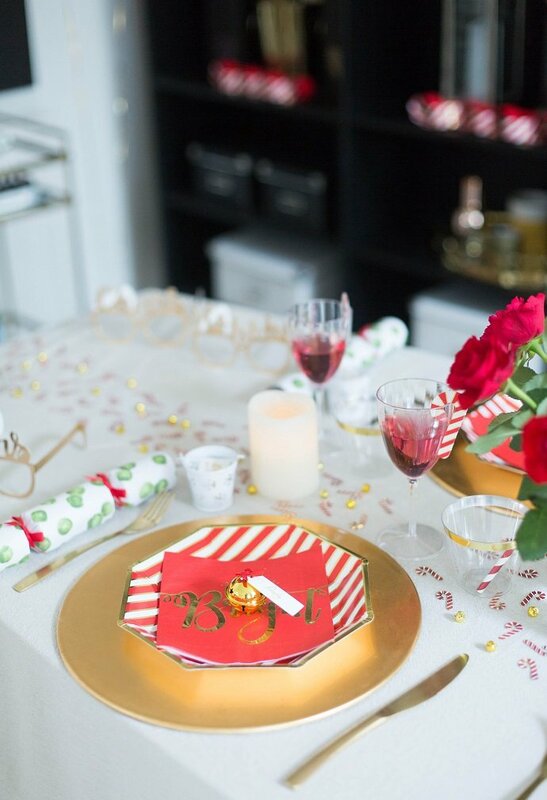 Whether you’re planning a small Christmas party for friends, or a large Christmas feast for the family, these red and gold party pieces will add the perfect finishing touches to your dinner table. Deciding on the centre piece can be a bit daunting. 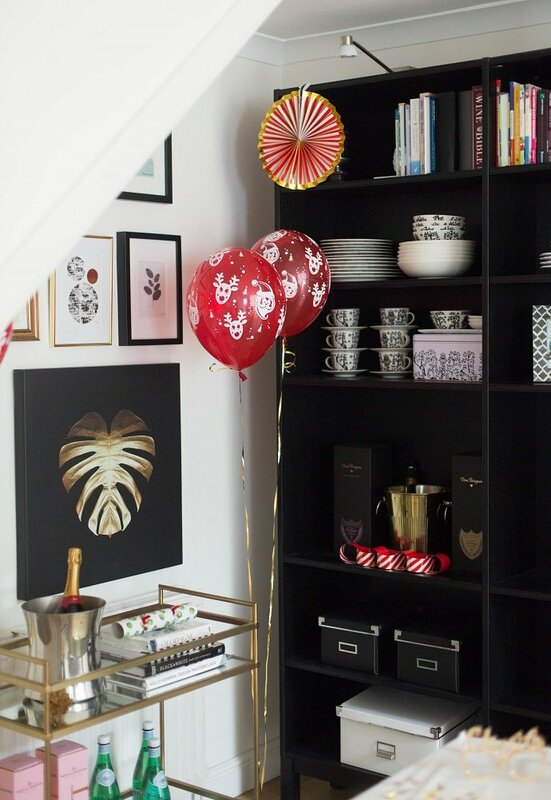 You’ll want something beautiful and practical that will impress your dinner guests. I like to keep things quite minimalist though. 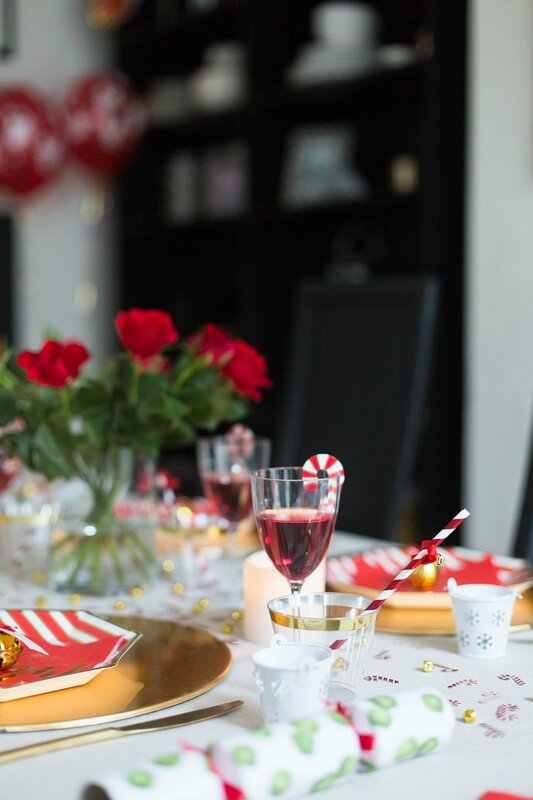 You don’t want to make the table too busy or distract your guest during conversation. Fresh cut flowers are always a good choice. 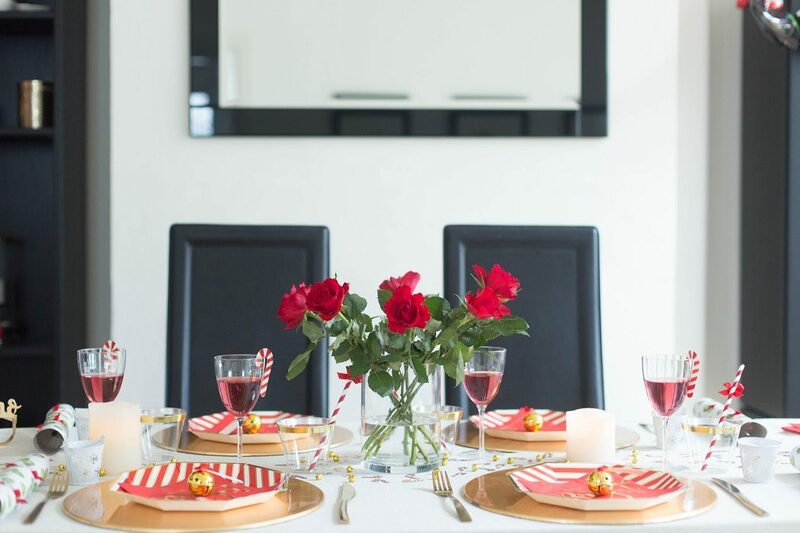 Red roses in a transparent vase are elegant and Christmassy, but remember to keep your flower arrangements low in the dinner table so they don’t block the line of sight for guests. A table runner is one of my favourite ways to dress up a plain tablecloth, but if you don’t have one at hand, why not create a table runner with some confetti? 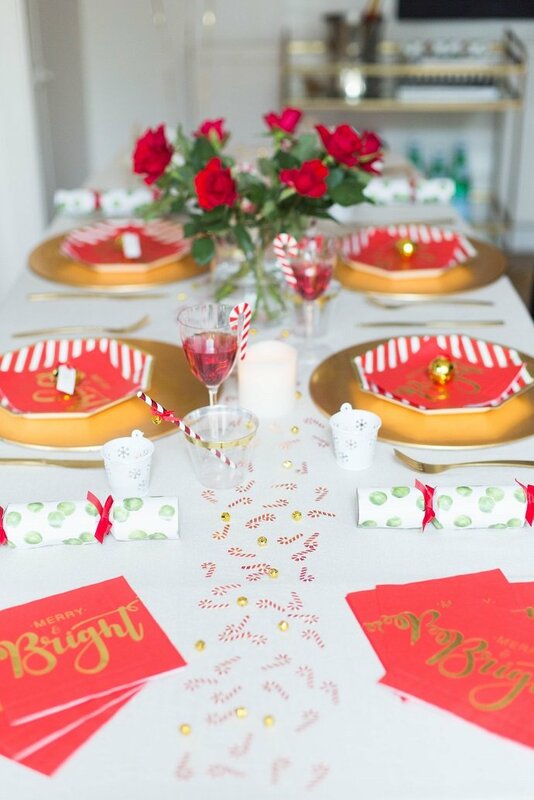 I used some foiled mini candy cane confetti and gold bell confetti to create a pretty runner in the middle. Together with the roses they make quite a centre piece, don’t you think? I also placed some LED pillar candles in the middle to add an ambient glow to the table setting. LED candles are much safer and totally hassle free in the dinner table whilst giving out a realistic candle light affect. These foiled striped paper plates will look striking on your dinner table. They go incredibly well with these merry and bright napkins and these adorable gold bell place cards. 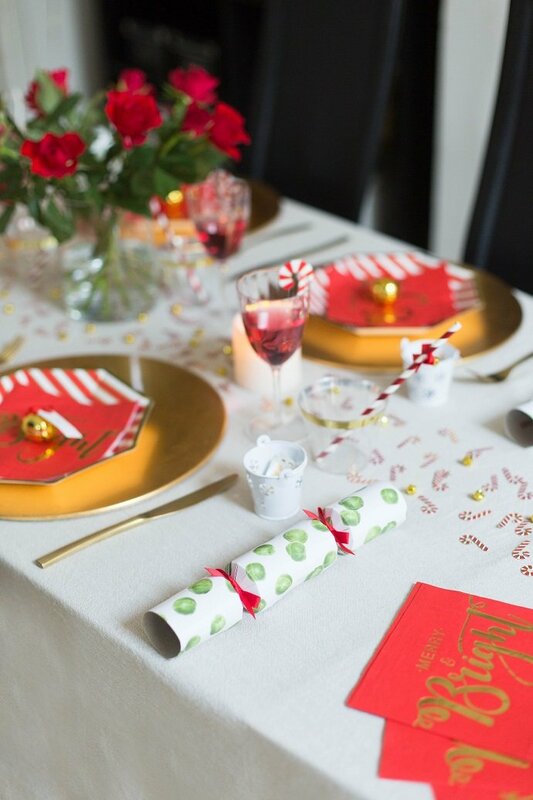 You can’t have a Christmas table setting without any Christmas crackers, can you? These quirky Brussels Sprout Christmas crackers have got to be the cutest Christmas crackers I’ve ever seen. The Brussels sprout trend is bigger than ever this Christmas, so watch this space! These premium plastic wine glasses are ideal for serving Christmas punch. They really are the next best thing to elegant crystal glassware. The best part is that you don’t have to worry about breaking them! 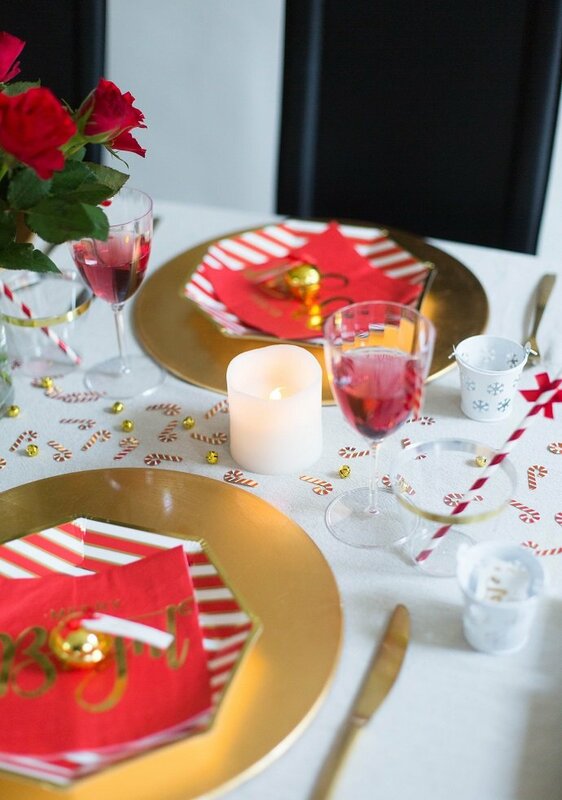 Don’t forget to make your wine glasses festive with these candy cane glass decorations. These premium gold trim tumblers will always look elegant with red and gold tableware. Pair them with the striped straws with bells to add lovely finishing touch to your Christmas dinner table arrangement. These festive gold tattoos will bring plenty of cheer to your dinner table. I can guarantee that both the adults and the children will love these. You could also use them as party favours. 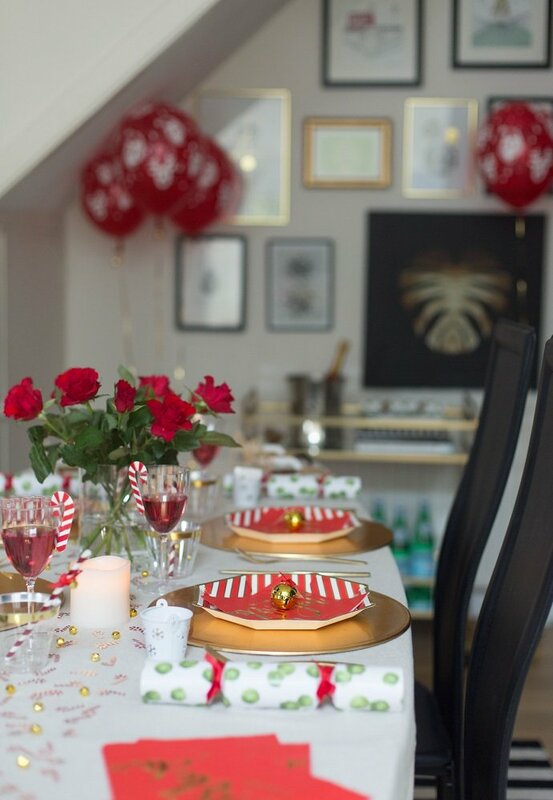 Place some favour pails on the table and fill them with festive gold tattoos to surprise your guests later. 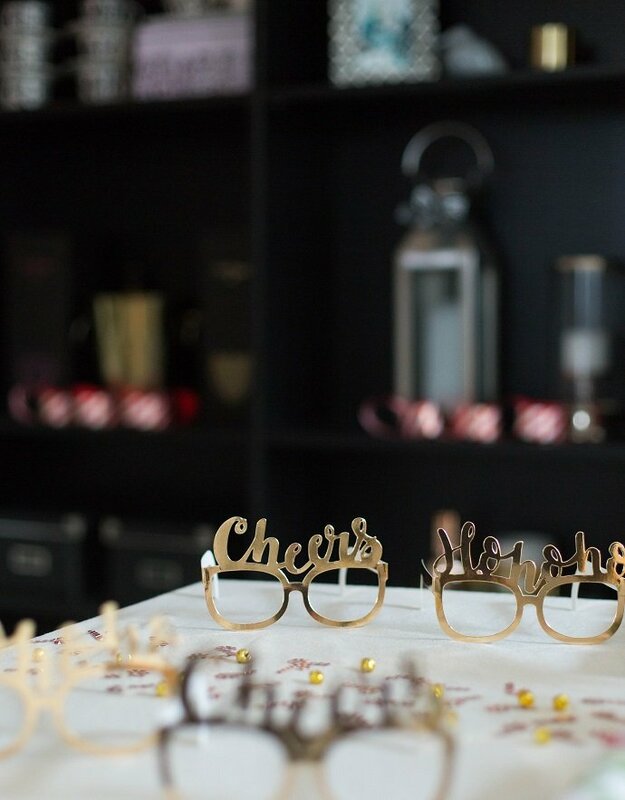 These festive gold glasses will add a fun element to your dinner party. Hand them out to your guests as they get seated and encourage them to take silly selfies before the dinner is served. Don’t forget to decorate the rest of your dining room. 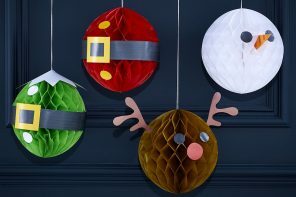 These Christmas balloons and foiled paper fans will add some traditional Christmas colours to your decor. 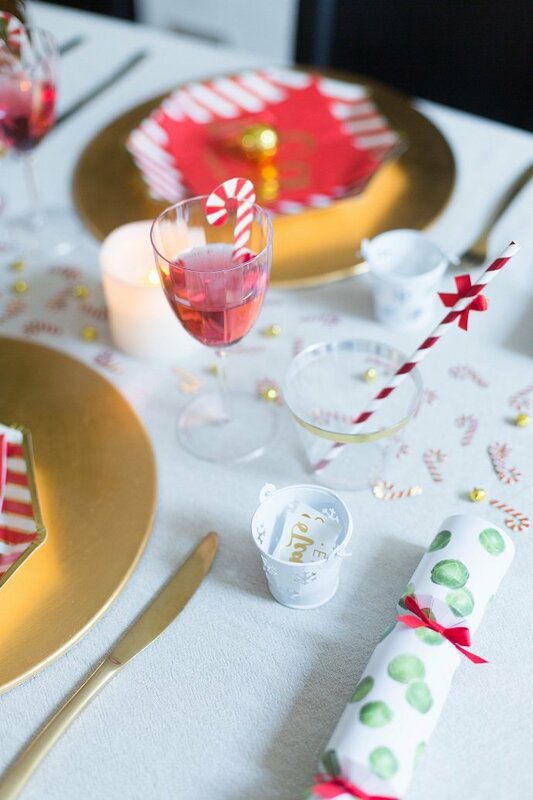 I also love that these foil paper chains can be used in so many ways. Place them on a bookshelf like I did, or on the Christmas tree to finish the look. Oh, and don’t forget to buy some helium and balloon weights before your dinner party. 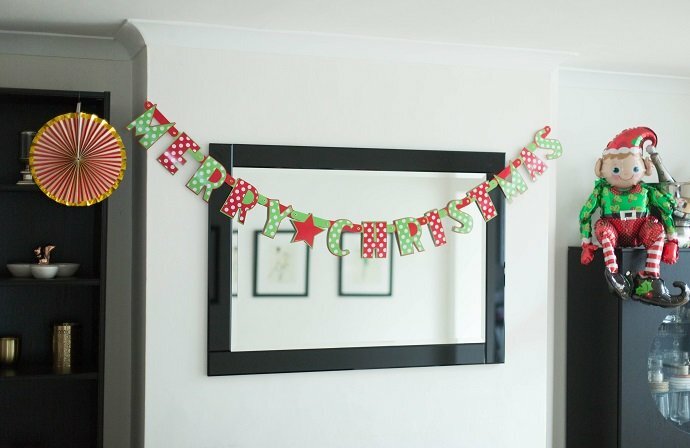 This pretty polka dot Merry Christmas banner will immediately add a quirky edge to any room in the house. Place it above the mantelpiece or across the mirror to transform your home for Christmas. Everyone will love this cute sitting elf balloon. It’s very easy to inflate, simply use a straw provided to fill him up with air. 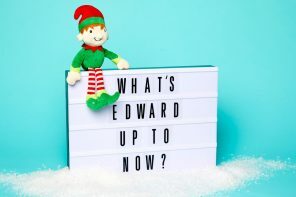 And let’s face it, every house needs an elf on the shelf. Who else is going to keep an eye on the kids and report their behaviour back to Santa?